Liver fibrosis, a kind of scarring of the liver's tissue, is usually diagnosed with a biopsy – an invasive surgical procedure to remove liver cells for lab testing. However, physicist Olivier Beuf believes that we can do better and has put together a team to develop an imaging technique that can be used in a clinical examination. Using the European Grid Infrastructure, he and his team have developed a 3D map showing how fibrosis affects blood flow in a diseased liver. These 3D maps could provide a reliable alternative to the usual biopsy procedure and have the potential to improve patients' well-being, as well as our understanding of liver disease. Representative perfusion map from a patient with chronic liver disease. Image courtesy Benjamin Leporq, Sorina Camarasu-Pop, Eduardo E. Davila-Serrano, Frank Pilleul, and Olivier Beuf. Chronic liver disease is never good news, but in about 20% of cases the condition escalates to severe inflammation and fibrosis, a kind of scarring of the liver's tissue. When this happens, it is very important to follow the progression of the disease and monitor the onset of fibrosis to guarantee the best treatment. Liver fibrosis is usually diagnosed with a biopsy - an invasive surgical procedure to remove liver cells for lab testing. However, Olivier Beuf of the University Claude Bernard Lyon 1, France, believes that we can do better and has put together a team to develop an imaging technique that can be used in a clinical examination. Using the European Grid Infrastructure (EGI), they developed a 3D map showing how fibrosis affects blood flow in a diseased liver. These 3D maps will be a reliable alternative to the usual biopsy procedure and will contribute both to patients' well-being and to improving our understanding of liver disease. Chronic liver disease is on the rise due to an increase in obesity, diabetes and metabolism disorders. "The most common cause of chronic liver disease is non-alcoholic, fatty liver disease," says Beuf, a physicist working in the medical imaging field for over twenty years. In about 20% of cases the disease progresses to aggressive forms, with inflammation and liver fibrosis leading to potentially fatal hypertension or even cancer. Beuf and his team used grid computing to perform the pixel-by-pixel analysis. The processing step was executed by parallelized jobs on EGI within the biomed virtual organization. The whole processing operation was modeled and implemented as a grid workflow using the Gwendia language and the MOTEUR workflow engine. The interface with the grid resources was provided by the VIP web platform. To describe fibrosis, Beuf compares the liver to a filter. "When healthy, the filter is soft and the blood from the different vessels in the liver is flowing normally," he says. "When you have fibrosis, the filter is getting tough and starts to be blocked. Then pressure is increasing in the vessels and you get hypertension." Current practice is to monitor fibrosis with biopsies - medical interventions where a physician removes a tiny sample of the liver for analysis. The trouble with biopsies is that they are an uncomfortable and invasive procedure with many risks for the patient. "Biopsies are unsuitable for clinical monitoring in patients and problematic in children," explains Beuf. "Moreover, liver biopsies have other limitations such as cost, inter-observer variability and sampling errors." So what could be the alternative? Beuf believes that 3D imaging of the liver is part of the solution. He teamed up with PhD student Benjamin Leporq, radiologist Frank Pilleul and a group of computer scientists to create a non-invasive imaging technique to replace biopsies as a method for diagnosing and monitoring liver fibrosis. The challenge was to develop an imaging method that can be used in everyday clinical examinations. The team started by collecting a detailed 3D magnetic resonance images from the liver of six patients and one healthy person to serve as control. From these images, they extracted physiological information, which was adjusted to a mathematical model using nonlinear least-square fit, to determine 3D liver maps. "This procedure, performed on every pixel of the 3D volume is extremely long," says Beuf. With normal computing resources, each 3D map would require several weeks of processing. So, to speed things up, Beuf used EGI's high-throughput computing solution through the biomed virtual organisation. 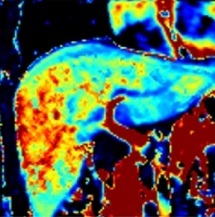 The results were, on average, 126 times faster than with conventional computing and allowed "a reliable estimation of 3D perfusion parameter maps of the whole liver in a reasonable processing time - hours compared to weeks," he says. "Our goal was unreachable without parallel or grid computing." The results, published in the Journal of Medical Engineering, show that detailed 3D magnetic resonance mapping of blood flow parameters is achievable with grid computing today. This article was originally published on the EGI.eu website, here.